Pink eye (conjunctivitis) is the inflammation or infection of the transparent membrane that lines your eyelid and eyeball. It's characterized by redness and a gritty sensation in your eye, along with itching. Often a discharge forms a crust on your eyelashes during the night. Pink eye (conjunctivitis) is an inflammation or infection of the transparent membrane (conjunctiva) that lines your eyelid and covers the white part of your eyeball. When small blood vessels in the conjunctiva become inflamed, they're more visible. This is what causes the whites of your eyes to appear reddish or pink. Pink eye is commonly caused by a bacterial or viral infection, an allergic reaction, or — in babies — an incompletely opened tear duct. Though pink eye can be irritating, it rarely affects your vision. Treatments can help ease the discomfort of pink eye. Because pink eye can be contagious, early diagnosis and treatment can help limit its spread. There are serious eye conditions that can cause eye redness. These conditions may cause eye pain, a feeling that something is stuck in your eye (foreign body sensation), blurred vision and light sensitivity. If you experience these symptoms, seek urgent care. People who wear contact lenses need to stop wearing their contacts as soon as pink eye symptoms begin. If your symptoms don't start to get better within 12 to 24 hours, make an appointment with your eye doctor to make sure you don't have a more serious eye infection related to contact lens use. Most cases of pink eye are caused by a virus. Both viral and bacterial conjunctivitis can occur along with colds or symptoms of a respiratory infection, such as a sore throat. Wearing contact lenses that aren't cleaned properly or aren't your own can cause bacterial conjunctivitis. Both types are very contagious. They are spread through direct or indirect contact with the liquid that drains from the eye of someone who's infected. One or both eyes may be affected. Allergic conjunctivitis affects both eyes and is a response to an allergy-causing substance such as pollen. In response to allergens, your body produces an antibody called immunoglobulin E (IgE). This antibody triggers special cells called mast cells in the mucous lining of your eyes and airways to release inflammatory substances, including histamines. Your body's release of histamine can produce a number of allergy signs and symptoms, including red or pink eyes. If you have allergic conjunctivitis, you may experience intense itching, tearing and inflammation of the eyes — as well as sneezing and watery nasal discharge. Most allergic conjunctivitis can be controlled with allergy eyedrops. Irritation from a chemical splash or foreign object in your eye is also associated with conjunctivitis. Sometimes flushing and cleaning the eye to rid it of the chemical or object causes redness and irritation. Signs and symptoms, which may include watery eyes and a mucous discharge, usually clear up on their own within about a day. If initial flushing doesn't resolve the symptoms, or if the chemical is a caustic one such as lye, you need to be seen by your doctor or eye specialist as soon as possible. A chemical splash into the eye can cause permanent eye damage. Persistent symptoms could also indicate that you still have the foreign body in your eye — or possibly a scratch over the cornea or the covering of the eyeball (sclera). In both children and adults, pink eye can cause inflammation in the cornea that can affect vision. Prompt evaluation and treatment by your doctor for eye pain, a feeling that something is stuck in your eye (foreign body sensation), blurred vision or light sensitivity can reduce the risk of complications. Use a clean towel and washcloth daily. Don't share towels or washcloths. Throw away your eye cosmetics, such as mascara. Don't share eye cosmetics or personal eye care items. Keep in mind that pink eye is no more contagious than the common cold. It's okay to return to work, school or child care if you're not able to take time off — just stay consistent in practicing good hygiene. Newborns' eyes are susceptible to bacteria normally present in the mother's birth canal. These bacteria cause no symptoms in the mother. In rare cases, these bacteria can cause infants to develop a serious form of conjunctivitis known as ophthalmia neonatorum, which needs treatment without delay to preserve sight. That's why shortly after birth, an antibiotic ointment is applied to every newborn's eyes. The ointment helps prevent eye infection. Preferred practice pattern: Conjunctivitis. San Francisco, Calif.: American Academy of Ophthalmology. http://one.aao.org/CE/PracticeGuidelines/PPP.aspx. Accessed June 2, 2012. Jacobs DS. Conjunctivitis. https://www.uptodate.com/home. Accessed June 1, 2017. Care of the patient with conjunctivitis. St. Louis, Mo. : American Optometric Association. http://www.aoa.org/documents/CPG-11.pdf. Accessed May 28, 2012. Riordan-Eva P, et al., eds. Vaughan & Asbury's General Ophthalmology. 18th ed. New York, N.Y.: The McGraw-Hill Companies; 2011. http://www.accessmedicine.com/content.aspx?aID=55781421. Accessed May 28, 2012. Rohren CH (expert opinion). Mayo Clinic, Rochester, Minn. June 6, 2012. Robertson DM (expert opinion). Mayo Clinic, Rochester, Minn. June 4, 2012. Jensen TB (expert opinion). Mayo Clinic, Rochester, Minn. May 19, 2017. AskMayoExpert. Conjunctivitis. Rochester, Minn.: Mayo Foundation for Medical Education and Research; 2016. Conjunctivitis. American Optometric Association. https://www.aoa.org/patients-and-public/eye-and-vision-problems/glossary-of-eye-and-vision-conditions/conjunctivitis?sso=y. Accessed June 1, 2017. 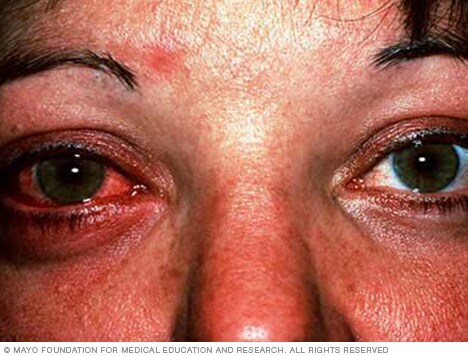 Pink eye: How long is it contagious?